There has been a change of plans for filmmaker Kevin Smith's anticipated "Mallrats" sequel. During a phone interview with WMMR's "Preston & Steve" show Friday morning, Smith told the hosts the project has evolved from a film into a 10 episode series for television. "I haven't told anybody this, so I guess this is kind of an exclusive ... It is happening. It's just taking us a longer time to build it. What we did is reconfigure it ... A couple months ago we started reconfiguring the idea of doing 'Mallrats' not as a film as a series." In September, Smith announced plans to shoot an update to the cult flick using the Exton Square Mall in Chester County as the backdrop. 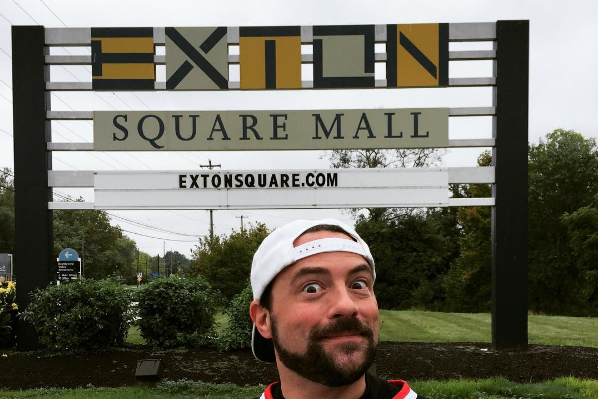 The local buzz around "Mallrats 2," or "Mallbrats" as it has been called interchangeably, started in May when Smith went public that he was considering using the doomed Granite Run Mall in Middletown, Delaware County, as the location for the project. But plans for the demolition of Granite Run Mall did not work with Smith's schedule, and the project relocated to Chester County, where Smith said he now intends to shoot the TV series version. "My plan is still to do it there because the Exton Square Mall people were absolutely lovely and the mall is perfect for all our needs ... As far as I'm concerned that's where we are going." Next step, Smith said is to find a network to broadcast the show. "Who knew that TV would be the salvation of that movie," he said. Listen to Smith's complete interview here.